SURREY, England--(BUSINESS WIRE)--BYD Ltd Company has been named “2013 Crash Test Facility of the Year” by Automotive Testing Technology International, marking a major milestone for BYD Auto. “When deciding on BYD for ‘Crash Test Facility of the Year’, the judges were impressed with some of the state-of-the-art equipment, such as the Bi-Trolley for towing and guidance, as well as the accuracy of facility results. They recognized the outstanding results coming from BYD’s test center such as the BYD S6 SUV five star crash test ratings and the BYD’s F5 Suri’s record crash-test scores from C-NCAP,” stated Graham Heeps Editor of Automotive Testing Technology International. This award indicates that BYD is prepared to be a major player in the international automotive market with superior capabilities in safety research and development. “I chose BYD China as crash-test facility of the year because I see it supports the growth of additional consumer crash-test programs in developing markets. In developing markets, fleet options are often strong, but crashworthiness information on local cars is not readily available to the customer. Working with Aries, BYD has designed a state-of-the-art crash test facility to do their own research and development to build safety into their cars,” said jury member Richard Morgan, Research Associate Professor, Center for Collision Safety & Analysis, George Mason University. “I feel that an important goal of the automotive community is to counteract the increase in road fatalities and serious trauma. Historically, the new car assessment programs have furthered safety by encouraging customers of passenger vehicles to choose a safer product.” BYD Motors Inc President Stella Li stated, "BYD has received a lot of international recognition for vehicle reliability and safety in the last couple of years. This year, not only did the BYD F5 attain the highest crash-test score for a Chinese brand, but we outperformed most international brands. JD Power selected BYD's F0 as the leader in the Compact Car segment and our BYD S6 was the first Chinese SUV to attain a 5-star crash-test score in China and was named "SUV of the Year". We believe that a significant amount of our success can be attributed to the fantastic work of our Testing Labs Staff in conjunction with our Vehicle R&D. The BYD approach to design and manufacturing is working and our results prove it. We are thrilled to be recognized by Automotive Testing Technology International for our World-class testing capabilities this year." Gaolin Li, Deputy Dean of the BYD Auto Engineering Research Institute said, “BYD’s testing capabilities have reached a world class level -- equipment such as lighting, dummies, materials and cameras used in the crash test labs are all from international suppliers with the highest standards.” Occupying 20,000 square meters (~216,000 sq-ft), the main runway lengths are 250 meters (over 820 feet long), and the lab can even test two cars at different speeds at multiple angles (from 1 to 360° collisions). 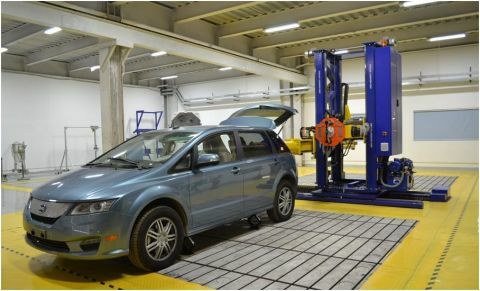 The center not only meets the international regulations and requirements for diverse vehicle testing procedures, but also maximizes research and development abilities for BYD’s own needs. For more information, please visit www.byd.com or www.facebook.com/bydcompany. Launched in 2006, the Automotive Testing Technology International Awards, organized by Automotive Testing Technology International magazine, are a non-profit enterprise designed to highlight and reward the efforts of individuals and companies who have made a difference in the world of vehicle development. Nominations for the awards are put forward by the readers and editorial staff of the magazine. A shortlist collated from the nominations received is then passed to an independent, expert jury to decide the results. The 2013 Awards consists of six categories: Engine Test Facility of the Year; Crash Test Facility of the Year; Proving Ground of the Year; CAE Innovation of the Year; Hardware Innovation of the Year; and Person of the Year. The winners of the first five categories are put forward for the overall Company of the Year prize. As the world’s largest manufacturer of rechargeable batteries, their mission to create safer and more environmentally friendly battery technologies has lead to the development of the BYD Iron Phosphate (or "Fe") Battery. This fire-safe, completely recyclable and incredibly long-cycle technology has become the core of their clean energy platform that has expanded into automobiles, buses, trucks, utility vehicles and energy storage facilities. BYD and all of their shareholders, including the great American Investor Warren Buffett, see these environmentally and economically forward products as the way of the future.